I have been waiting for the right technology to enable me to rid myself of my traditional door locks. While I’m not completely satisfied with my current selection, I found two I was willing to try, the August (on the left) and the Kevo (on the right). In this post I’ll discuss both. Let’s face it; Apple has set an amazingly high bar when it comes to product packaging. I love acquiring new Apple products because it is fun to open them and experience the unveiling. The August wins this battle hands down. While probably not a big deal in the end, it sets the initial impression upon which all the rest of the experience is built. The Kevo is a Kwikset product and installs just like any other Kwikset deadbolt device. The August on the other hand is very simple and quick to install. When you install the Kevo lock, you install a new outside key mechanism, a new deadbolt, and a new interior locking mechanism. The box contains all of the components, hardware, and even adapter pieces to adapt the system to various sorts of doors, doorknob holes, etc. It is very complete and only requires you provide a screwdriver and effort. If you are putting these locks on several doors of your home, it comes with the tools and instructions to rekey the exterior key system so a single physical key will open all of the doors. The August system only replaces the interior portion of your existing deadbolt; this has pros and cons. This characteristic makes the installation a snap. You simply remove the interior portion of your existing lock, attach the August mounting bracket in its place, and slip August onto the bracket. In addition, if you rent or lease a property and the contract stipulates you can’t change the locks, this enables you to have a smart lock and still be in compliance. The downside of this simple interior replacement is that it can cost you. 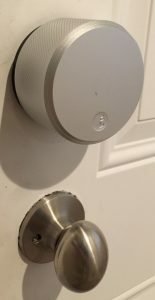 In my application not only was I interested in obtaining smart locks, I was eager to replace my failing existing lock systems. In my scenario I had to purchase August, a new deadbolt system, and then throw the interior portion of the brand new mechanism away. With August costing $250, roughly $60 more than Kevo, this additional expense is significant. Both systems enable you to gain access to the protected premises using traditional physical keys. As mentioned earlier the Kevo comes with new physical keys while the August uses the same exterior key that came with your original lock. The biggest difference between the two locks, in terms of virtual keys, is that those for the Kevo cost $1.99 as an in app purchase, for any beyond the first two, while those for August are free. This is mitigated a bit by the fact that when you purchase a Kevo key and allocate it to a guest, family member, etc. you can reclaim it and reissue it without paying an additional fee. This is much like having additional keys made for your home and temporarily giving them to others. Virtual keys for the Kevo system are distributed to others via email while those of August are distributed via text message. Shared keys can be adjusted to give guest access for a period of time, for set times and days of each week, or for anytime access. Keys can also be distributed that permit admin access to see entry logs, distribute keys to others, etc. Both systems are very similar in this respect. Once a key is distributed in the Kevo system it will be active until you delete the individuals access rights. In the August system the key can be revoked or temporarily disabled. This feature might be convenient when you’re having your carpets cleaned, wood floors refinished, etc. and you don’t want others in your home, but you also don’t want to send the message, “we don’t love you anymore”. To gain access to the premises with the Kevo system you approach the door with your iOS or Android device on your person, with the app installed, and reach out and touch the lock. The LEDs in the lock blink blue and a few seconds later the door is unlocked. When you exit the premises you simply touch the lock again and it locks. This feels very natural and sounds great, but it doesn’t always work. Most of the time the described scenario works, but just as you get in the habit of leaving, touching the lock, and proceeding on your way, you don’t hear the familiar locking sound and you have to return and repeat your effort. Unlocking the door sometimes requires two tries, not often, but sometimes. There is an alternative scenario. Through a $50 / year subscription to Kevo Plus you can unlock and lock the door remotely as long as you have Internet connectivity. In addition, the Kevo does come with a FOB that enables those without a smart phone to access your home. However, since the system allows the use of a physical key, that is smaller than the FOB, the value of this feature is questionable; kids do love it! There are two main ways to gain access using the August. The first is by pulling out your phone, opening the app, waiting a few seconds for the app to recognize the lock, and then pressing the unlock button. I wouldn’t mind pulling my phone out to unlock the door, but having to find the app, open it, wait for it to find the lock, and then finally unlocking the door drives me crazy. Thank goodness there is a second way. In the August app you enable the auto unlock feature and set a radius from the lock on a map. When you leave your home, lock the door, and exit the predefined radius, the app takes note. The app interprets your reentering the predefined radius as an indication that you’re returning home and starts trying to acquire the lock via Bluetooth. When you get within Bluetooth range the lock unlocks. When you get to the door you simply enter. This feature makes the lock usable. Your existing physical keys still allow you access to the premises; there is no FOB sort of device. For an additional one-time $50 purchase you can buy the August Connect device that connects the lock to your home WiFi and hence the Internet. This is useful because it enables you to lock and unlock the door from anywhere you have Internet connectivity. Instead of sharing keys with other random visitors you can simply open the door for them and lock it when they leave. The Kevo feels like any Kwikset deadbolt system, substantial and reasonable quality. The August feels less durable, more plastic, and for my test unit the battery cover periodically falls off. This does not affect the security of the premises, but does feel like you purchased an expensive, but cheap toy. Thus far my family likes the August better than the Kevo. The Kevo fails them periodically and this does not instill trust; none of us want to carry a physical key for the time it refuses to open. With August Connect you acquire remote locking for a one-time $50 purchase while the same functionality for Kevo is $50 per year. The auto open mode on August makes it useable, without it August would be intolerable to use. While the August costs $60 more then the Kevo you get unlimited free virtual keys and August Connect as a one-time feature. After two years of use the Kevo would cost as much as the August and that cost would continue to increase. Neither of these devices has an open API that would allow them to be connected to other home systems. August supplies a closed API, for their trusted partners, through their August Connect device. I am unaware of an API for the Kevo system. Both companies take the typical path of requiring the user to acquire an account, install a specialized app, and “caring” for the user’s data, keys, credentials, etc. These closed systems make it difficult to include these locks into the broader and more interesting smart home movement.